I would like to start this letter by saying two things…I am sorry and you are beautiful. I’m sorry for all the terrible things I’ve said and thought about you. You are an amazing creation that God designed specifically for me. You have carried me through 40 years of playing + walking + moving + learning + thinking + creating + loving + living. I’m sorry for letting what other people think change my thoughts of you. Remember when we were little and we were friends? 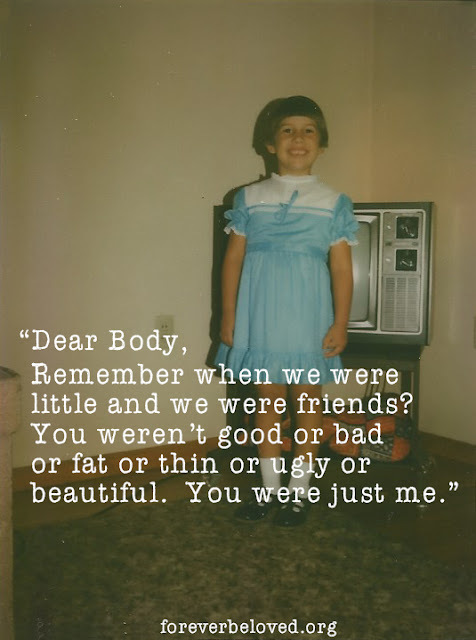 You weren’t good or bad or fat or thin or ugly or beautiful. You were just me. You were the vehicle I rolled down grassy hills in, screaming with laughter. I wrapped myself in you to swim in the ocean with my Grandma. You were the cocoon I snuggled in to sleep at night. We've walked the streets of Mexico, the shorelines of beaches and countless parades while I twirled a rifle (which I hit you with many, many times). We've birthed two perfect, extremely large babies and we've fed them with milk we made from cheeseburgers, steak salads and cold cereal. We've walk endless miles with my Mama shopping. We've danced for hours, all sweat and motion. We've survived! You have endured multiple displays of my clumsiness, bad luck, horrible aim and dumb-flat-feet-make-me-trip. And by multiple I really mean uncountable...but yet, you kept going. You didn't throw your hands up in the air and say that’s IT, this girl is unreal…how can she fall UP the steps and DOWN them? Not to mention the countless surgeries over the past few years. Through it all, you never gave up or gave in. Not even in ICU where you were so, so very tired. It's because of you that this Mama can see her kids grow up. After all that, how do I repay you? I belittle you. I call you fat. I complain about you. I compare you to every single woman that walks past me. I talk to you worse than I ever would speak to anyone else. I want to appreciate you for what you are, not what I wish you were. I want to appreciate every inch of you. The stretch marks that show I carried two babies. The lips and eyes that show my heritage. The nose, crooked from being broken multiple times, that show I truly am as clumsy as I say. The face that may sometimes droop on the left side that shows I'm a survivor. The scars that show I'm alive! I wish I would have appreciated what a perfect gift God gave me when He gave me you. I am so grateful for you and I vow I will try as hard as I can to change the ugly way I speak to you.